The winning St Mary's tennis team. ST Mary’s Anglican Girls’ School has won back-to-back tennis championship titles. 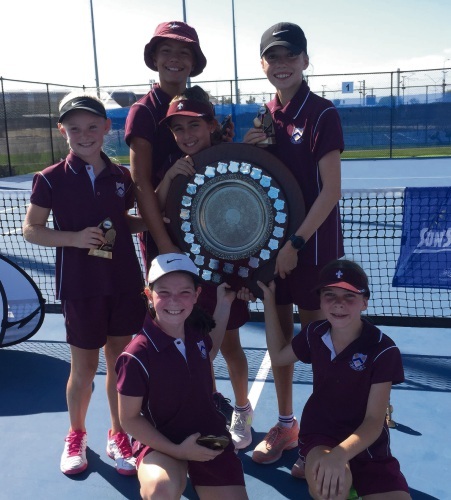 Year 5 and 6 students from the Karrinyup school won the metro Girls Academy Plate at this year’s Schools Tennis Classic. Poppy MacCondruin, Sophia Larsen, Hannah Sexton and Ella Barmentloo (Year 6) and Kristin Kirby Smith and Alison Healey (Year 5) successfully defended the school’s title at the State Tennis Centre on March 21. The girls were triumphant against North Cottesloe Primary School in the final.